His conversations with the owners of orchards and berry fields led to the idea. An idea challenging traditional thinking. An idea addressing consumer demand. Amit Dhingra, Ph.D., took his idea into the laboratory in the Department of Horticulture at Washington State University. The idea moved forward, fueled by the skills and creativity of a team of undergraduate students and graduate researchers working side-by-side with Dhingra, a specialist in plant genomics and biotechnology. 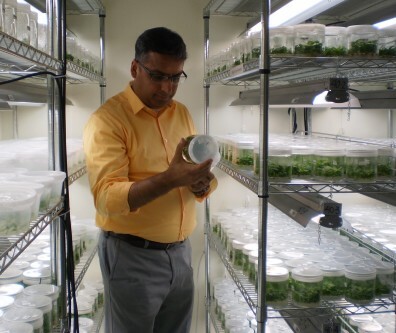 Dr. Amit Dhingra, a specialist in plant genomics and biotechnology, checks the progress of propagating plants at Phytelligence, the first plant-focused biotechnology startup to come from WSU. Their discoveries in the lab led to a product and a process to enhance propagation and speed the development of root stock sold to nurseries. A product and a process that utilizes a nutrient-filled gel-like substance in place of soil, conserves water, and reduces the need for pesticides, fungicides, or insecticides as the young trees or plants grow. A discovery in a WSU laboratory empowered by private support. Contributions from growers and nurseries kept the momentum going as the team pushed forward in refining the process of growing fruit more efficiently. Prompted by suggestions from two of his undergraduate students, Dhingra soon turned his attention to the business side of science. With the aid of WSU’s Office of Commercialization, in partnership with the Office of Economic Development, the next steps took place: determining commercial potential, protecting the technology behind the product and the process, drafting a business plan, and entering the marketplace. The first plant-focused biotechnology startup to come from WSU is creating new jobs in Pullman. Located within the WSU Research and Technology Park, Phytelligence is poised for dramatic growth. Recently, a generous investment from the Washington Research Foundation is fueling the growth of Phytelligence, co-founded by the team of WSU students and their professor-mentor in 2011. Current inventory includes plants from four to five apple, two pear, five cherry, one raspberry, and three hop varieties. Orchard and berry field owners want a sound return on their investment; there is very little room for risk, Dhingra says. During site visits and discussions with growers, he learned that traditionally grown fruit trees or berry plants can experience damage or stress during delivery, resulting in significant losses. And in some cases, growers received a different plant variety than they ordered—a costly mistake that might not be realized until a few years later. The growers provided valuable information to put to work in the lab. The research team investigated tissue culture and performed genetic analyses of cuttings from fruit trees. 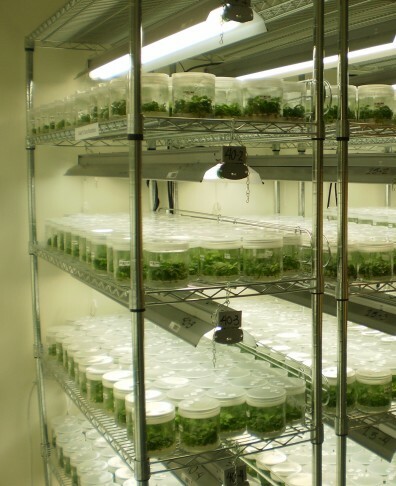 Team members developed unique tissue culture protocols and variety-specific media formulation to enhance propagation. A proprietary agar-based growing medium is the key ingredient that starts the process. The gel-like substance contains purified water and carefully measured nutrients to provide a good start for the future apple, pear, or cherry trees, raspberry bushes, or hop vines. Every step of the process takes place in a sterile environment to ensure the quality of the plant material. Phytelligence can eliminate plant mortality because the plants developed through the Phytelligence process have very robust roots, Dhingra says. Every plant is genetically verified to assure the material is true to type. The propagation method is also resource-efficient and ecofriendly. For every tree produced with this method, 80 gallons of clean water are saved, he says. And plants grown in sterile containers require no pesticides, fungicides or insecticides. Traditional methods of propagation produce 10 to 20 plants per year from one plant. Phytelligence can produce 250,000 plants per year from one plant, Dhingra says. Traditional methods can take 15 to 20 years to develop a new plant variety and then another 10 to 15 to deploy it on a large scale, he says, adding that when commercial growers place orders, they sometimes have to wait as long as seven years for trees to be propagated and delivered. A plaque on the wall at Phytelligence headquarters highlights a U.S. Patent awarded to Dhingra and Scott Schaeffer, who was earning a Ph.D. at WSU at the time. The patent protects a discovery that took place in Dhingra’s lab at WSU. Based on conversations with pear growers, the question was posed: how do we bring back the natural taste and aroma in fruit where the ripening process is artificially stopped or slowed? For two years, the scientist and his students worked on developing the compound that ultimately became a patented product used to stabilize and regulate ripening and quality in fruits and vegetables. Phytelligence founders are Amit Dhingra, Kathie Nicholson, Tyson Koepke, Scott Schaeffer, Nathan Tarlyn, and Derick Jiwan. Aside from developing future entrepreneurs, Dhingra’s laboratory is nurturing a valuable source of revenue for WSU: royalties from product licensing and sales.